One of these things is not like the other. When it came time to take the photo above, I couldn't find one of the mascaras, and had to use one of the older ones I kept around for color reference. Don't worry folks, I have since found the missing mascara, and it's doing fine. 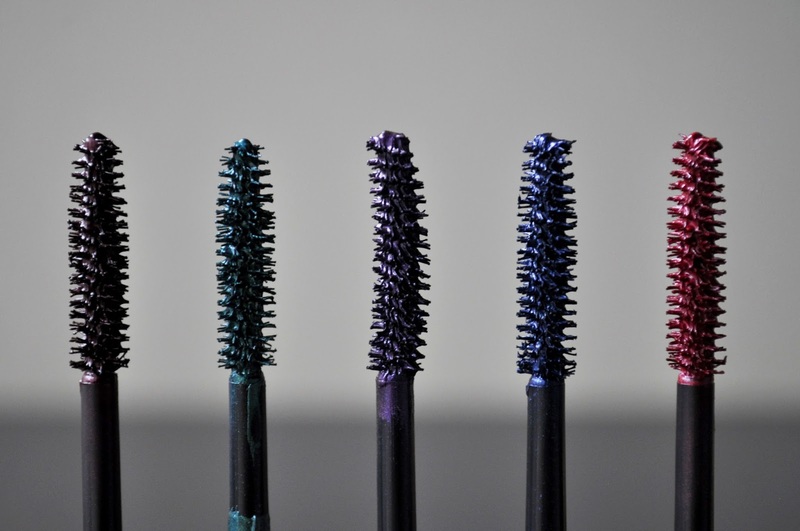 I fell in love with the Sparkling Mascaras when they were first released in 2013, with the Secret Nights collection. So, you can imagine my excitement (and yes, I think you can) when I discovered ADDICTION was re-releasing them this Summer. 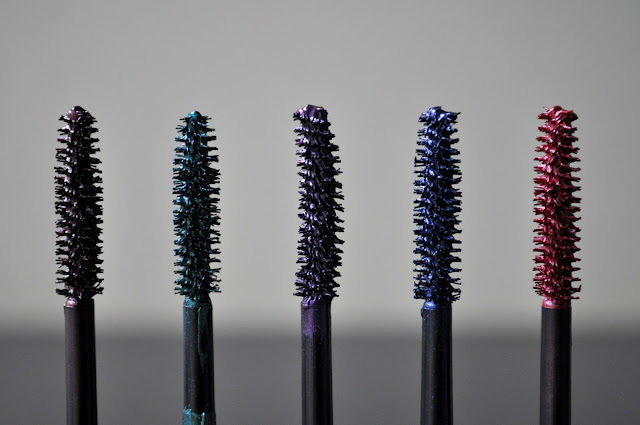 These colored mascaras are somewhat different than their original counterparts. First, there are five colors instead of six. Secondly, the shades that have made a comeback are 02 Fanfare, 03 Color Purple, 04 Night Dive, 05 Lady of the Lake, with 01 Tough Love being the new edition. And lastly, these mascaras has a straight wand, whereas their predecessors were curved. From left to right: 01 Tough Love, 02 Fanfare, 03 Color Purple, 04 Night Dive, 05 Lady of the Lake. 01 Tough Love: a plummy-maroon brown. 02 Fanfare: a bright, emerald green. 03 Color Purple: a deep purple. 04 Night dive: a marine blue. 05 Lady of the Lake: a burgundy-red. The Sparkling Colored Mascara WP defines and separates, and gives a little volume and length, but not that much. Even on days were the humidity levels were in the high 90's, this resilient waterproof formula kept my mascara from flanking or smearing. 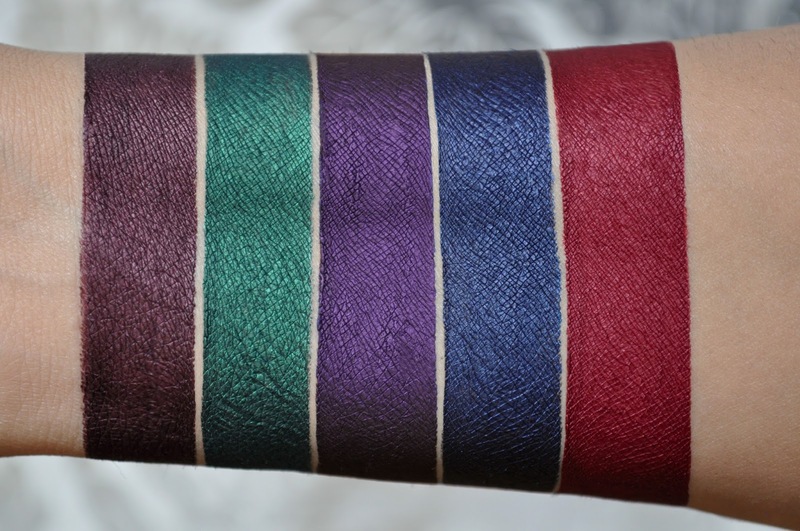 While not vivid, they are pigmented and give the lashes an eye-catching wash of color. Also, the formula is creamy and contains shimmer. However, the shimmer is so microscopic, it's almost unnoticeable, except in certain angles when the light hits your lashes; hence, giving them a beautiful radiant effect, and not glittery at all. whether worn on both my upper and lower lashes, or just the tips of my upper lashes, or solely the lower lashes (heck, I've even worn them on my brows), I'm infatuated with all five shades, and have been rotating between them, and another shade (post coming up soon), this entire season. I couldn't help but to ask... do you still have any mascara left in the tube after the arm swatch? Hahaha, That's what my sister always tells me whenever she sees my swatches. 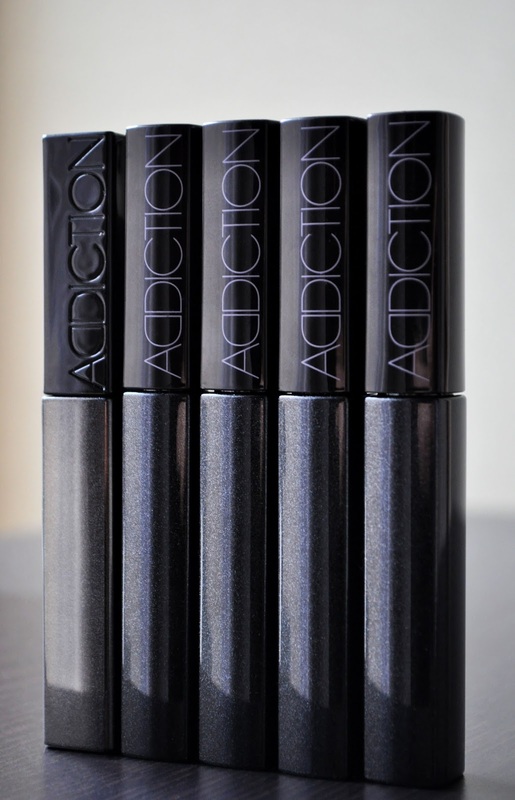 These mascara's are very creamy and pigmented. Therefore, they applied easily with minimal product waste.